Narrated by Richard Ferrone, Marc Vietor, Kevin Pariseau, Victor Bevine, Susannah Jones, Mark Boyett, L J Ganser, Jonathan Todd Ross, Jonathan Davis, Kevin T. Collins, Nick Sullivan, Angelo Di Loreto, David Marantz, and Gabriel Vaughan. ©1932, 1941 Street & Smith Publications, Inc.; 1959, 1968 Condé Nast Publications, Inc. (P)2018 Audible, Inc. Please, more Pulps of The Shadow! Absolute best thing on Audible. Walter Gibson was a genius and The Shadow is the best fictional character, ever. Great narration. Richard Ferrone is perfect for The Shadow! The characters come alive in this masterful, full cast audio production of timeless The Shadow. I am old enough to remember listening on radio and love the stories. This one was handled with excellence and love. Superb, the best Audible rendition of The Shadow's classic adventures yet. Excellent cast, music & sound effects backing the words of Walter B. Gibson. I have been very pleased with these dramatized readings of the old Shadow pulps, and this one is no exception. When a businessman of note disappears after returning from a trip to Russia, the Shadow sets his forces to track the man down. After discovering his location, the Shadow discovers a plot to carry out a great theft and has mere days to make his way back and forth across the Atlantic to deliver justice. 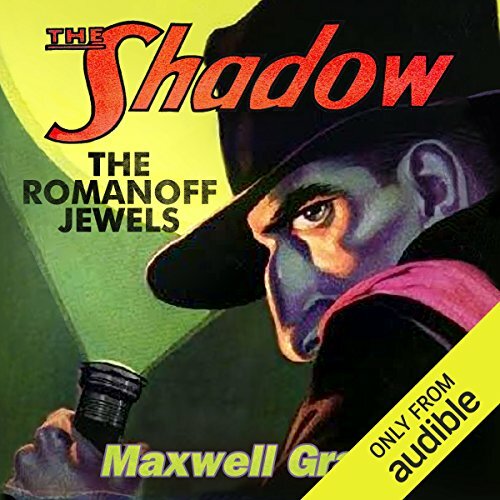 The Romanoff Jewels is one of the stories that showcases the Shadow’s adaptability in foreign lands as well as in New York. It’s always interesting to hear of scenarios wherein the Shadow’s skills are put to a new challenge. The cast once again put forth fine performances. Like with the others, they are just serious enough to offer tension, yet have an undeniable cheese factor that makes them just the slightest bit humorous, reminiscent of the radio shows of the 30s. As a long time Shadow fan, is brings me great joy that the books are getting some recognition almost a century since their inception.